This winter has been something else. Planning trips has been challenging due to the snow conditions on the roads and the trails. Plus, I’m still adjusting to my new home and figuring out where to go locally. Today’s trek brought me and a friend to Clear Lake, Sahalie Falls and Koosah Falls. Looking through my maps and guidebooks, I patched together a route I thought would go. We parked at the Ikenick Sno-Park and crossed the highway to the Clear Lake Resort. I knew there was a trail that went all the way around the lake. We decided to head south, along the lake’s western shore, to join up with the McKenzie River trail. There were only a few glimpses of the lake from the trail, which was somewhat disappointing. When we reached the southern outlet of the lake we picked up the new trail, crossed the road and headed towards the waterfalls. 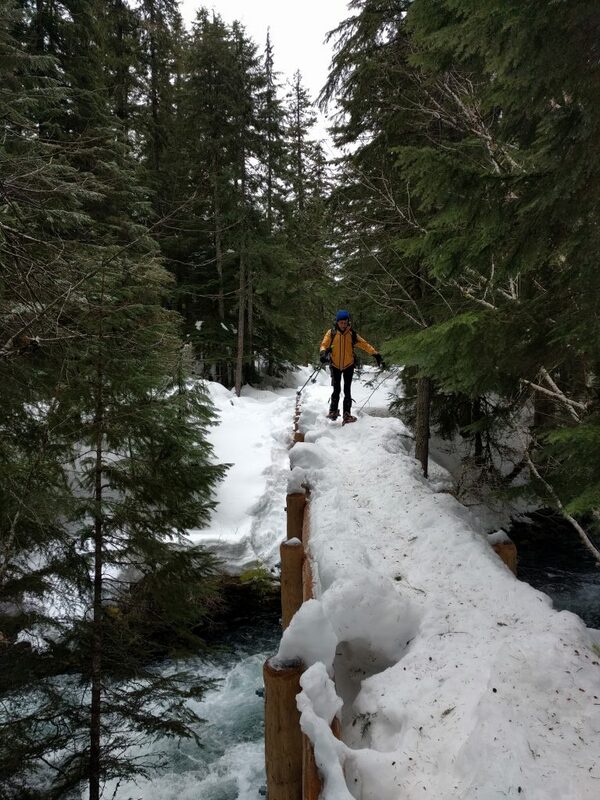 A wooden footbridge crossed the McKenzie River. Snow was piled on top of the bridge to the height of the handrails. We moved carefully across on our snowshoes to the other side. This is where the real adventure began. The tracks all but disappeared and we set off in a dense, dark forest along the river. The snow covered the trail so we were sidehilling on a slippery surface, with drop-offs down to the raging river. I breathed a sigh of relief when we made it to Carmen Reservoir. The footing was much more gentle and flat here. And on this side of the river the trail was broken out. At least we did the difficult half first. We ambled along the river, stopping to enjoy the tremendous views of the river and falls. Sahalie Falls was particularly memorable. 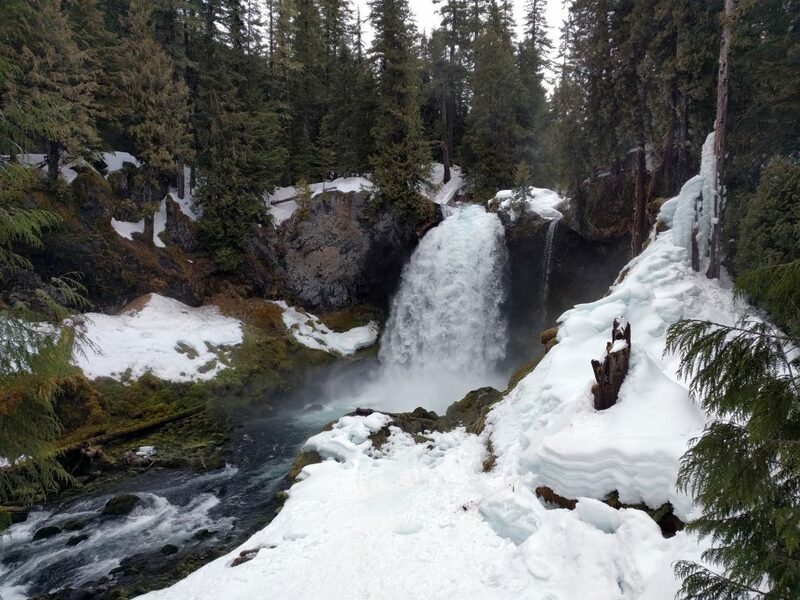 The cold air had transformed the waterfall spray into magical ice formations. Frozen drops of water clung to the needles in the trees. Layers of frozen snow created abstract shapes near the river. It was a movie-set landscape, too good to be true. It was a nice place to stop and have some food. What a pretty sight. We followed the trail back to Clear Lake. Suddenly, it wasn’t so clear where to go. We had to find the other segment of the trail, the part that went along the eastern shore. Wandering around, we stumbled across a sign and set off on the lake’s edge. This side of the trail was much more scenic than the other side. There were beautiful viewpoints over the lake. Neuron-like shapes were frozen into the lake’s surface. The air was so quiet. As we wrapped around the north side of the lake, there was again a bit of confusion. Where would we cross the creeks? Were there bridges? Signs? Did we miss something? Would we have to cross on our own? No, we just had to keep walking for another 5 minutes or so. The trail was right there. On the final stretch back to the resort we came across two people taking a short jaunt from the cabin. We knew we were close then! Winter presents its challenges, but not without its rewards. 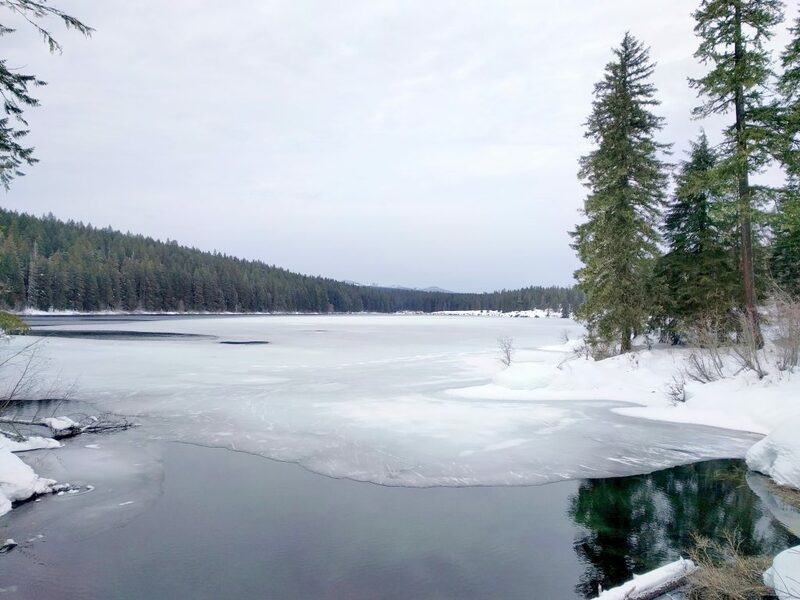 The extra hard work, uncertainty and routefinding enabled us to see a unique landscape covered in snow and ice. And solitude at Clear Lake? Unheard of. I won’t be back this summer, but perhaps I’ll venture out here the next time we’re in a deep freeze. 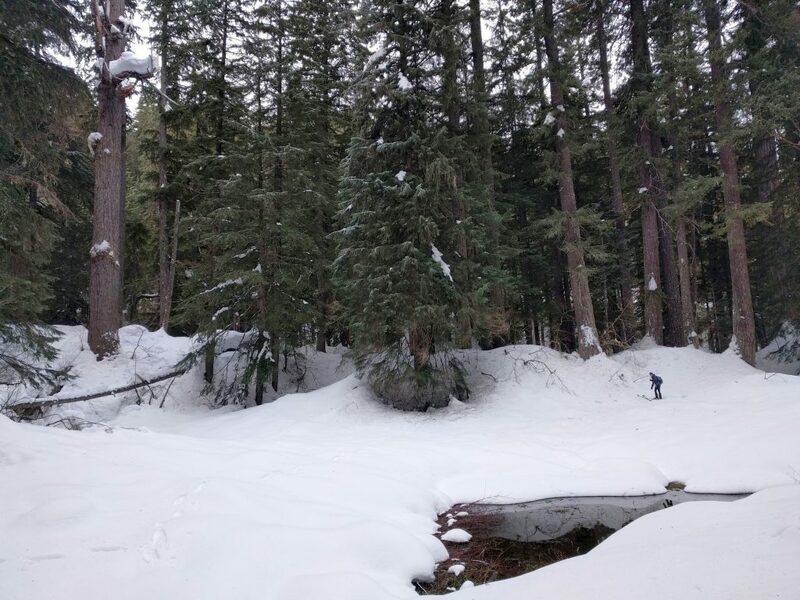 This entry was posted in Hiking, Oregon and tagged hike366 on February 2, 2017 by Jess B.